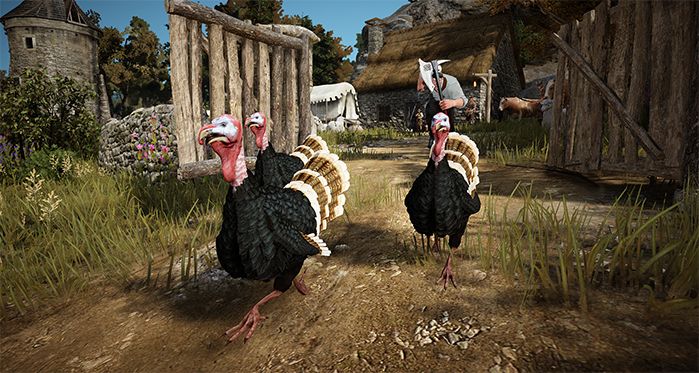 Hunt some Turkeys and celebrate the harvest season of Black Desert! [Event] Thanksgiving quest has been added. [Event] Thanksgiving Field Boss ‘Targargo’ has been added. The level cap for PvP has been raised to 50. (Previously 45). You can activate PvP mode with Alt + C.
Marketplace bidding system has been changed to have 3 stages. All items will be posted on the marketplace 10~15 minutes after registration. All items will have ‘B’ marker when the item is first posted, with the exception of pearl items. [Bid] All users may take part in bidding for 30 seconds after ‘B’ mark appears. This can be done through bidding button. After 30 seconds, the bid button will change to [check bidding]. When you click [check bidding], you can check if your bidding was accepted or not. [Check bidding] will remain for roughly 20 seconds, and all users who participated must check bidding. You will need to insert a PIN when bidding and checking, in addition to having enough silver in your inventory or regions warehouse for the intended item. If you do not click [check bidding], you will not be able to receive the item, even if you won the bid. Failure to do so will result in the item becoming available for all users. You will now be able to buy items from the marketplace without typing in the captcha code. The [check bidding] button can be deactivated when you confirm the bidding from the marketplace. You will not be asked to input the amount of items when you bid for stacked items in the marketplace. You can input the amount at the [check bidding], [purchase] stage. All items that are not in the middle of bidding process can only be purchased at the bottom price. Camera view adjusted so that riding or shooting a cannon from a Galley and Epheria will have a wider field of view. Camera effect improved after you have surfaced from the water. Camera control when controlling the fishing boat has been improved. A sound effect has been added when you deactivate the light ping on the world map. The volume of the pet sound effects for Cursed Looney has been decreased. Character’s movement sounds will now differ depending on their worn armor materials. Ambient sound will now be turned on while in garden deployment mode. The interior of houses will now be brighter. When a character reaches level 16, a system message indicating the ‘Day/Night’ cycle will now be in effect. ‘V’ key message will no longer be shown in the arena. System messages will now appear when you receive a daily guild payment. When using the skill add-on system without having a Memory Fragment or Cliff’s Skill Add-on Guide, the system message indicating this is not possible will now be displayed immediately. When first creating a family name a new message will display asking you to confirm the selected name. World notification will no longer be shown when obtaining Red Coral Earring and Blue Coral rings. The game will now remember the last chat type used when reloading (with the exception of whispers). You may now open the world map while fishing! Navigation while in the tutorial quests has been improved. Lightning has been added to storms. Adjusted game settings to display the scenery as darker to reflect the appropriate weather conditions. The brightness of Lightning effects in the ocean has been adjusted to be less bright. When you press Q in the water, you can begin to recover stamina. When you have successfully completed 3 grabs in a row on an opponent, they will receive increased resistance to grapple. When a character climbs over a wall while in Awakening, his/her weapon(s) is no longer visible. The animation for calling a mount while in Awakening has been improved to make it look more natural. Characters will no longer jump when pressing space bar while taking photos. Fixed the issue where nothing happens when taking a picture in beauty album. Fixed the issue where HP displays when a character picks up a burden for a quest. When you use the skill Reckless Blow, before the skill movement ends the damage will decrease. Skills, Guard and Great Sword Defense, won’t be able to be Locked via the command lock feature. While using the skills Charging Thrust, Quick Charging Thrust, and Double CHarge, the switching action to the Great Sword has been improved to be smoother. Required WP decreased for the skill Ground Smash. Required WP decreased for the skill Spinning Slash. [30 WP recovery on successful hit] effect has been added to the skill Shield Charge. The recovered amount of WP has been increased when a the skill Forward Slash has been successfully landed. Warrior’s eyes will now blink in combat stance. Fixed an issue where warrior’s frown while in combat stance. Fixed an issue where WP recovery was not properly applied while using the skill Chopping Kick. The amount of WP recovered while using Shield Strike II has been increased. The amount of WP recovered while using Sideway Cut II has been increased. The description of the following skills have been modified. Slash, Sideways Cut, Charging Slash, Shield Strike, and Charged Shield Strike. Skill added, Increase Grip, which increases the success rate of grapple skills. The amount of WP consumed has been decreased when using Head Chase. Front Guard won’t be applied during the cool down time of Flow: Armor Break. Invincible will now be applied when the character goes back to standby stance after using the Head Chase(backwards) skill. The buff effect of GreatSword Training that has been applied to close-range attacks will now applies to all attacks. Fixed an issue where Wind step was not used correctly when the character switched to the standby animation from non-battle to longbow battle stance. Fixed the issue where Flow: Piercing Wind was not used correctly when you set Charging Wind to locked. Fixed an issue where your character changed to non-battle animation when you were frozen with the awakened weapon out. 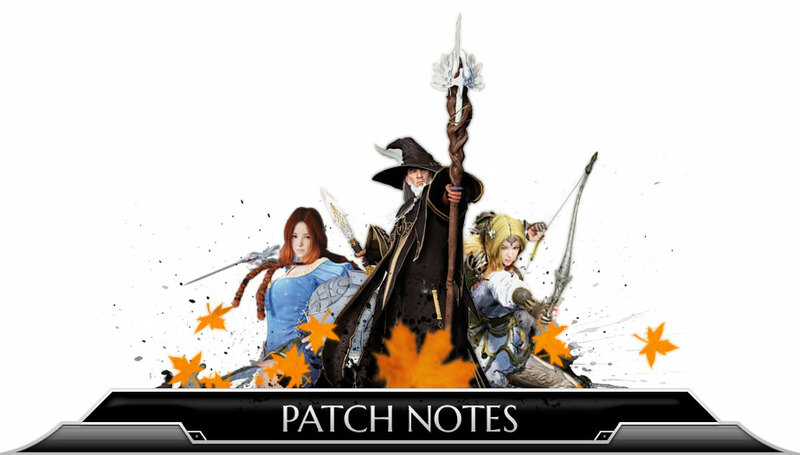 The description for the skill Charing Wind has been changed regarding MP consumption while on horseback. The description for the skill Flow: Bypassing Wind has been changed to include the key commands. The cooldown has been decreased for the skill Regeneration. The cool down has been decreased for the skill Nature’s Tremble. When using the skill Waltz of Wind and Breezy Blade, the add-on affecting the hit chance has been changed. The required MP has been decreased for the skill Wind Step. The key commands have been added on the description of the skill Breezy Blade. Fixed an issue where the effect was randomly displayed while using Vine Knot. The invincible effect will no longer be applied after certain actions are taken while using wind step ( back or forward ). The description for the skill Shadow Riot has been changed to show its activation condition. The accuracy has been increased for the skill Blade of Darkness. You can now use the skill Shadow Eruption faster after using the skill Night Crow. The animation has been improved to be smoother when in combat standby stance with an Amulet equipped. Accuracy has been increased for the summoned blade for the skills; Blade of Darkness and Flow: Cry of Darkness. Air attack of Violation has been adjusted. Fixed an issue where Titan Syndrome's buff was displayed incorrectly. Fixed an issue where your character changed to non-battle animation after certain actions. While using the main weapon, the cloak was not appearing correctly and has been fixed. Fixed an issue where certain motions continued to be used when using the skill Predatory Hunt. Accuracy has been increased for the ability Flame Buster’s black spirit skill. The level requirement has been changed for the skill Beastly Wind Slash I.
PvP damage decreased slightly for the skill Beastly Wind Slash. PvP damage increased slightly for the skill Flow: Slugfest. Front guard effect has been added for the charging of the skill Flow: Ancient Wave, and Super armor effect has been added while attacking with the skill. Smash damage hits have been increased from 2 to 4 of the skill Wrath of Beast and Ire of Beast. Super armor effect has been added at the beginning of the skill Fearsome Tyrant with 100% black spirit rage. Damage increased for the skill Blasting. Super armor effect has been added at the beginning portion of the skill Fearsome Tyrant. An issue has been fixed where the character had an abnormal pose after using the skill Fearsome Tyrant with 100% black spirit rage. Accuracy has been increased for the awakening skills with 200% black spirit. Skill added, increased Grip, which increases the success rate of the grapple skills. Opponent stun effect has been added on the successful hit of the skill Devastation. For the skills Wrath of Beast, Ire of Beast, Beast Roar, and Fearsome Tyrant, the character will recover 350 HP every second while the character has an appearance of a beast. Required WP and cool down have been adjusted for the skills Wrath of Beast, Ire of Beast, and Beast Roar. You can now use the skills Wrath of Beast and Beast Roar during Iron Buster combat stance. Fixed the issue where the player's character leaped more than it was supposed to if the player changed the window setting to Windowed Mode while performing Giant Leap. Corrected the Wrath of Beast II and III's Smash Attack's description in which it claimed to register 2 hits when it actually registers 4 hits. Some skills of Heilang changed. Cool down of the skill ‘Attack’ changed to 10 seconds. When using the skill Legendary Beast’s Power via quick slot with Bo staff, switching motion to the short sword will go smoother. The video clip of ‘Attack’ skill has been changed in accordance with the changes in its animation. Skill connection improved from Soaring Kick to Whiplash during celestial bo staff combat stance. Action speed greatly improved for the skill Absorb Heilang for all skill level. Action speed greatly improved for the skill Heilang: Berserk. Cool down for Heilang summon skill changed from 120 seconds to 6 seconds. CC effect changed for the skill Heilang Dance. Action speed improved for the skill Heilang Dance and the damage adjusted according to its motion. Bug fixed where the floating effect was applied during the cool down for the skill Flow: Intimidation. Bug fixed where the critical rate is not applied randomly on the skill Moonlight Strike. Connected movement after the skill Ultimate: Jolt Wave has been improved to be smoother. Fixed an issue where the skill command lock was not working correctly with the skill Heilang: Whiplash. Fixed an issue where the hit was not being applied correctly when using the skills Heilang: Whiplash and Lightning of Earth while in a quick slot. Attack Distance of the skill Flow: Gust and Leaves Dropping has been adjusted. When the skill Leaves Dropping is under cool down, you can now use the skill Flow: Gust at any time. Fixed an issue where the effect was not appearing correctly when you used the skill Black Turtle after the skill Leaves Dropping and Flow: Gust. Damage increased on the skill Garuda. Damage in PvP has been increased for the skill Flow: Garuda. Damage increased for the skill Flow: Ascension. Damage in PvP has been increased for the skill Flow: Ascension. Fixed an issue where the weapon was not properly switching when using the skill Soaring Kick in a quick slot. Fixed an issue where the restricted action was not being applied correctly on the skill Legendary Beast Dance. Connective motion for the skill ‘Flow: Gust’ has been improved. Fixed an issue where Heilang followed the character when using “V” skill. Fixed an issue where the resistance stat was not going down on the character information interface after using the skill Heilang: Berserk. Fixed an issue where you can’t use the skill Leaves Dropping and Flow: Gust after using the skill Legendary Beast’s Power. Guard effect will not be applied when the character goes back to standby stance after using the skill Garuda. Fixed an issue where only one hit was applied when repeatedly used via hotkey. Fixed an issue where movement was behaving in an abnormal way when unsummoning Heilang during awakened stance. Fixed an issue where all resistance percentages did not decrease properly after Heilang: Berserker duration had ended. Skills, Guard and Strong Defense, will not be able to be added to skill command lock. Connective motion for the skill ‘Divine Power’ has been improved after using ‘Severing Light’. The amount of consumed SP for Glaring Slash has been decreased. Front guard effect added for the skill Shining Dash. Skill description has been modified on the skill Sharp Light. Connective motion speed has been improved from other skills to Shield Chase Skill. Fixed the issue where Glaring Slash V consumed a different amount of SP than indicated in its description if performed consecutively. Fixed an issue where the damage amount of Staff Attack VI wasn’t applied correctly. Fixed an issue where the Evasion speed slowed down when using the skill directly after using Fireball. Fixed an issue where the staff was not appearing during some social actions. Damage decrement amount for the skill Magical Shield decreased. Casting speed for the skill Speed Spell has been increased, and the next skill used after will be casted faster. Description has been changed for the skill Blizzard, ‘Front guard while being casted’. Fixed an issue where you can’t see the weapons after certain actions in the pearl shop. Side sprint animation has been improved with normal weapons in non-combat stance. Fixed an issue where the character movement was unnatural when using the skill Chase under certain circumstances. Fixed an issue where the characters movement was not smooth when using some commands during the Chase skill. The distance of the skill Chase has been adjusted to match the Maehwa. Connective motion for the skill ‘Blooming’ and ‘Carver’ has been improved while using ‘Chase’ (backwards). Required WP decreased for the skill Chase. Super armor will now be applied instead of invincible when the character goes back to standby stance after using the skill Chase (backwards). Front guard effect will not be applied when the character goes back to standby stance after using the skills Retaliation and Retaliation: Decapitation. Skill lock function on Retaliation Stance has been removed. Chase speed has been adjusted when using awakened weapon. Movement distance of the chase skill has been adjusted when using awakened weapon. Skill connection improved for the skill Chase. Ultimate: Whirlwind Cut’s skill lock function has been removed. Skill lock function on the skill Retaliation Stance has been removed. Fixed the issue where abnormal movement was displayed when clicking LMB while using chase in awakened stance. Stopping motion improved while in non-combat stance. Standby motion improved while in non-combat stance. Eyes will blink while in combat standby stance. Ghost Step moving distance increased slightly to match Kunoichi, except in forward direction. Fixed an issue where you can use the skill Sky Stepping continuously while in the air. Fixed an issue where you landed abnormally when using the skill Ghost Step while an awakened weapon was equipped. When your weight is over 125% you cannot jump while sprinting. Ghost Step moving distance has been increased slightly to match Ninja, except in forward direction. You can no longer get oceanic fish from Heidel’s fountain. A safety zone 'Kuit Strait' has been added near the Ferry Crossing Keeper of the Kuit Islands. So that the ship can escape smoothly. Ship summoning location has been changed at Abandoned Ferry. Categorized totems with fish species has now been unified to ‘Totem of the Sea’. This item will gain EXP when you fish all types of fish. The Item Elion’s Blessing is no longer character bound, excluding event items. Characters will no longer emote the cheering animation when receiving Black Magic Stones or Red Coral Earrings. 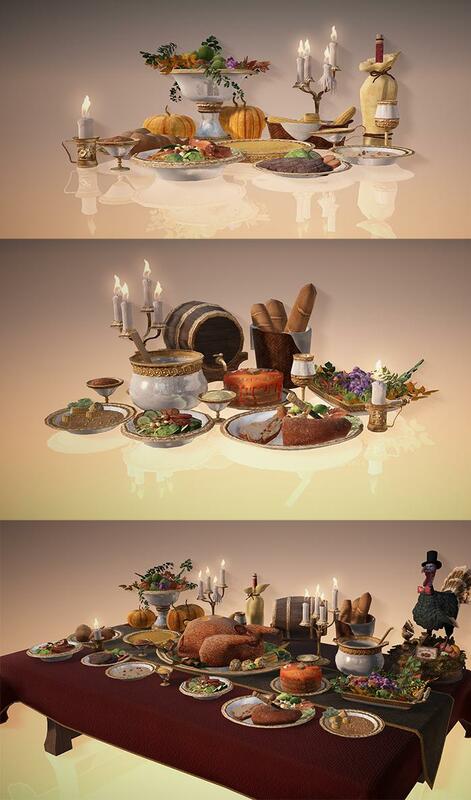 You may purchases Balenos at Goods and Cooking NPCs. You can craft Serendia’s and Calpheon’s at Tool workshops. These tools have higher durability but the alchemy and cooking time will increase. Marketplace register price for Intermediate / Advanced Alchemy Tools has been increased. You can no longer sell the items [Practice] Lynch Cannon Assembly Set and [ Practice ] Cannonball to NPC vendors. When you equip the items Lahr Arcien Barding, Trina Knight Barding, and Karlstein Barding the extra horse hair on its legs will no longer appear. A design required to craft these costumes can be obtained from Heidel Blacksmith Ornella’s Amity Shop. The material item [ Worn Out Cloth] can be obtained by drying [ Washed-Up Laundry] from fishing. You may change the costume with a Tailoring coupon to have an effect with +15% amity gain, but may no longer register it for sale after making this change. A new item ‘Kutum’s Potential Aura’ has been added. You have a chance to obtain the item when you kill the world boss Kutum. You can get 1 Cadry Piece Obsidian Decoration by combining 5 Ruby Decorations. You can get 1 Cadry Piece Ruby Decoration by combining 9 Blue rings. You can get 1 Basilisk’s Piece Snake skin belt by combining 5 Alignment pins. You can get 1 Basilisk’s Piece Alignment Pin by combining 9 Basilisk’s rings. A new cooking and potion knowledge has been added. You may now reform Blue grade Awakening Weapons into Ultimate Yellow grade. Slightly increasing the weapons AP. Item "Necklace of Schultz the Gladiator" has been added. You are now given the option to skip the tutorial if you have a character that is above level 50 on your account. Continuous durability recovery will now work correctly even if the material armors or memory fragments are below the scroll line of the inventory window. The height of the waves is now affected by the weather. Background landscape will now look more natural when boarding on a fishing boat. Imperial trade function has been removed from the Imperial Trade NPC. Imperial trade seal exchange NPC has been changed from Imperial Guild Trade NPC to Imperial Delivery NPC. The probability of the school of freshwater fish to be spawned has been slightly increased. All tier 4 pets will now loot items further away and react faster than before. Maximum task round amount at a time increased greatly. Durability will now be recovered to 100% when you finish upgrading a Barricade to the Iron Barricade version during Node/Conquest Wars. The max durability of the Wooden Gate has been dramatically decreased. The Durability of Wooden Fences, Wooden Fence Gates, and Fortress Gates have been significantly decreased. Damage from Elephants, Flame Towers, and Hawachas to characters have been decreased. The resurrection cool down time reduction per installed recovery center has been changed from 10 seconds to 6 seconds. The effect of reducing the resurrection latency through the Restore Point has been changed to take effect at the maximum wait time (120 seconds), not the minimum wait time (10 seconds). The recovery center is not as important directly after the node or siege war begins, but will become more important as the resurrection standby time increases. You can now use the observation mode during the resurrect standby time when you die during Node / Conquest Wars. Characters from an opposing guild during Node / Conquest wars will have their name displayed in red even if wearing a camouflage costume. Nodes owned by a guild will have the tax automatically collected 15 minutes before the start of Node / Conquest wars. Recovery center function has been changed to ‘decrease resurrect standby time’. Each recovery center will reduce 6 seconds from the resurrect standby time. After 10 minutes from the beginning of the Node / Conquest war start, resurrect standby time is increased by 1 second for every minute. Each death results in an increase of 1 second, and the effect is stackable. The maximum character resurrect standby time is 120 seconds. The rules will be applied on characters participating in Node / Conquest wars only. Characters will resurrect with full HP/MP during Node / Conquest Wars. Guild gathering functions have been added for Node/Conquest Wars. As soon as the war begins an icon will display in the top right corner of your screen. This allows you to teleport to the fort by clicking the icon. This can be used only for the guild members who are waiting at the correct war channel before the war begins. Entering after the war begins will not allow use of this feature. Characters located in Red Battle Field, Prison, or inside of the castle (or within 30M from the fort) cannot use the icon. The icon will disappear 110 minutes after the war begins. Guilds can no longer accept a new guild member 2 hours prior to a Node / Conquest war beginning if they are participating in the war. All guild members may now call guild mounts. General guild members can now sell guild exclusive items to the guild shop. Horse market list will refresh when you have failed to purchase a horse. Stats have been increased for wild horse of level 2 or higher. You can now change and train the skills for private elephants and camels. The distance for mount check-in has been increased. Improvements to the graphics of personal elephant equipment have been made. Reduced the time it takes to move from a trot to a gallop whilst auto-pathing on your mount. You can now add beer and recover worker's action point while the workers are under their task. The posture of Burita Allon, trade manager of Valencia, has been adjusted. You can now start a conversation with Dichzy Borne on Lema Island. Basilisk's Lair has been improved. It has been widened and contains more Basilisk's. Added Additional random Liten spawns to Valencia. The distance at which you will see the name tag of Liten’s has been adjusted. Drop rate for the quest item ‘Weird Devices’ have been increased. NPC Quest tutorial has been added to Western Guard Camp. Removed knowledge related to imperial guild trade materials. The NPC that starts the quest ‘It’s no use hiding!’ at Alejandro’s Farm has been changed. The quest description of ‘Gift for Happiness’ has been updated to add the combining pattern and method of the quest items. New trade mission has been added to the guild mission. When the <material consignment> mission is completed, the "Special Order" button will be displayed to Guild Master. If you receive special products and deliver them to NPC, your mission will be completed. If a special product is destroyed, you can re-acquire the item through the special order button. You can accumulate guild funds when you complete the mission. You can view your recommended repeatable quests here and you can even automatically set your path to them. Item description for furniture has been added. Crafting notes have been adjusted for the Herbal Juice and Grain Juice. Removed the set effect from the tool tip description for [Halloween] Bat wings chandelier. Item description UI location has been changed on the marketplace. Camera managing instructions have been added in the pearl shop. If no quests are available when the suggestion tab is at 0, it will not be shown. The description of the Miniature Elephant’s equipment has been modified. The item description has been improved for the items Cliff’s skill add-on guide and Armstrong’s Skill guide. Item description has been adjusted for mount Brand spell stones, allowing Elephants to be imprinted as well. New available skill icon can be hidden when right clicked on. You may now close all new obtained knowledge alerts at once. The item description window in the inventory / pearl / equipment interface will no longer show up next to the item but will automatically display at the top. The item description window at the warehouse will now show up next to the warehouse inventory. You may now open the Red Battlefield UI while you are in combat stance. Combat / Non-Combat stance toggle button has been added to Dye UI. The item interface has been improved so that you can view the item amount and cool down timer at a glance. Challenge Complete interface has been improved: when you scroll down to the bottom and receive all the rewards it will automatically scroll to the top now. The skill Add-on interface has been improved. Conquered nodes will show in the guild information window. Guild incentive interface has been improved. General guild members can now see the guild mount icon. Item descriptions will show up when you put the mouse over the guild skill buff icons. Item description has been improved on Adventurer’s Compass parts. When you close the ‘Recent Memory’ window it will not automatically re-open for 24 hours. The icon effect location has been improved for Maids. When you summon pets, you will now see the total effect (including the basic skills) of the activated pets in the pet skill window. The default appearance of the beauty album download ranking and author ranking has been changed from Recent 1 day to Last 7 Days. The icon of the item [Battlefield] High-concentrated Herbal Juice has been changed to match the High-Concentrated Herbal Juice. All categories will now show up in the Attendance Reward Window. You can now open the Inventory and Equipment window by pressing the I key while using the Marketplace through an NPC. Guild position at the Guild Window has been changed to an Icon. Preview at the pearl shop has been improved for furniture sets. The message for building Node / Conquest war buildings and traps has been fixed. An alert message has been added informing players that kicking a member of the guild will result in them being disconnected from the game. There will be a comma (,) on every 3 digit number when you receive the guild’s daily pay. A new function has been added where you can compare marketplace gear items with currently worn gear. Recharge: Recharging window will be reset after a charge. Polishing: Registered alchemy stones will remain after polishing. Growth: Growth result will show up on the alchemy window and the window will reset after the item effect shows up. You will now see the applicable attendance reward windows only if your account is able to receive them. The size of the font in the game tips has been modified. A description has been added for each dye button in the dye window. The location of the awakening weapon and awakening weapon costume in the dye window has been modified to be easier to find. The quest widget has had an appropriate description applied to it. An issue has been fixed where the guild name was not being properly displayed in the contract and renewal window. Bug fixed where auto loop and direction show up abnormally on the world map when you click a node. Fixed an issue where the worker information interface was not closing correctly. A bug has been fixed where nothing would happen when taking a photo in the beauty album. A bug resulting in the black spirit indicating a quest was still available even when none were has been fixed. An issue where auto pathing was not working correctly in the Basilisk area has been fixed. An issue where scrolls at challenges were not working correctly has been fixed. An issue where you could not strafe the camera while inspecting the fountain in Heidel has been fixed. An issue preventing character order from being changed has been resolved. Fixed an issue where Node War buildings / towers were randomly shown in completed appearance when you started building them. Fixed an issue where some effect icons were not aligned for certain food buffs. Fixed an issue where you can see the HP of Ancient Rutum when you do not have the knowledge. Fixed an issue where the chatting space was changing at random when pressing the Alt key while sending a whisper. Fixed an issue where the durability was appearing when you picked up or rode on certain quest objects. Fixed an issue where the node tax information window was not activating correctly. Fixed an issue where the item amount on the quick slot did not refresh immediately when purchasing potions. Fixed an issue where the Apply button was sometimes not activated after adjusting game settings. Fixed an issue where the character search window would remain after interacting with the Black-Robed Man. Fixed an issue that was preventing the proper item name from being displayed in the system message when you receive items inside the cart. Fixed an issue where the character info and chat messages displayed above the head were being hidden by trees or buildings. Fixed an issue causing the Game Tip UI Off setting to be initialized after talking to NPCs. Fixed an issue where the icon location was not displaying correctly while using the guild skill Gathering Cry and the item Archeologists map. Fixed an issue where the distance control gauge was not appearing for Cannons and Hawachas. Fixed an issue that was causing the size of the displayed guild in the guild ranking window to be incorrect. Fixed an issue where the item description and equipment condition was different for thin and thick harpoons. Fixed an issue where the interior point remained on the mouse cursor after collecting the furniture. Fixed an issue where the crop information window was not activating correctly. Fixed an issue where the quest UI turned back on when you opened the world map after turning the UI off in the interface editor. Fixed an issue where the chat window was not turning on when resetting the interface. Fixed an issue where the chat window settings were not saved on interface edit. Bug Fix: You can now properly gain knowledge of #1-5 Hansen Radolf’s Logbook. Bug Fix: Fixed an issue where Palm Forest Boy XII was not completing correctly. Fixed an issue where the Investigate command was not appearing on statues & carts for these quests. That's huge. Thanks for delivering. Bloody nice job ole chap! So many good changes. It almost feels like Christmas. But it was so funny watching people fish there. That said, thanks for the notes! Love the work in this one. So this is what what we been downloading the last few weeks. im blind or they didnt add it yet , gold bars instead of silvers when you trade the trash items dropped by mobs? Holy, this is a big patch. Can you please translate these to English ? Glad half the notes listed don't even apply to content in our game yet.